Young people experiencing homelessness face many forms of extreme adversity including high rates of mental health and addiction challenges. These challenges lead to high mortality rates and increase the risk of chronic homelessness. In turn, the health service systems and providers in most settings are poorly equipped and resourced to meet the mental health needs of the homeless youth population. This intervention guide was developed to provide timely and relevant guidance to direct service providers on how to intervene more effectively with youth who have experienced homelessness. An internationally recognized group of editors and authors have, in this volume, assembled intervention strategies that youth workers and managers in the homeless sector can readily apply in their day to day work. Rigorously reviewed by leading academics and practitioners, this guide addresses a key gap in the field – a one-stop resource for practical guidance on how to better intervene with this highly marginalized population. 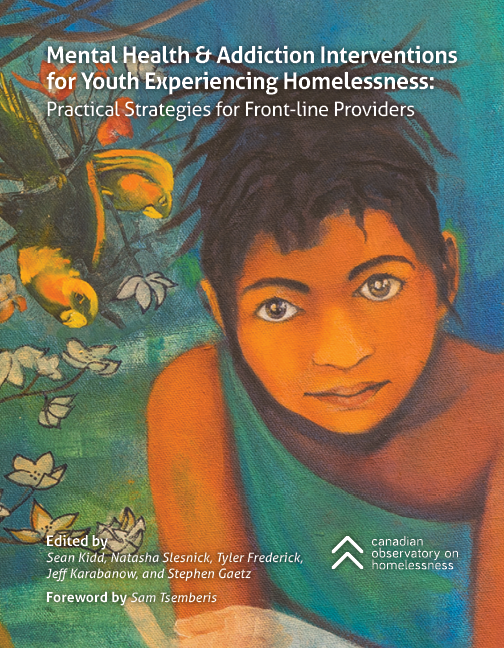 The "Mental Health & Addictions Interventions for Youth Experiencing Homelessness: Practical Strategies for Front-line Providers" book is also available in paperback via Eva's Print Shop. Through their innovative profit-for-purpose social enterprise model, Eva’s Print Shop helps homeless youth build better futures. Cost: $25 CAD + s/h.